This relief sculpture is attached directly to the building wall. The piece shows three figure forms, the largest in the center with two smaller forms on either side. 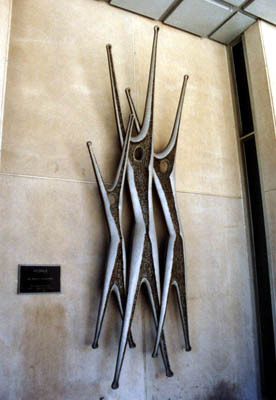 The technique is characteristic of Robert Koepnick's public pieces in which he uses cast aluminum. The center of each form is textured with the edges smooth and shiny silver. A plaque to the left of the sculpture reads: People/By Robert Koepnick/On Loan From The/Alex V. DeMarco Family/June, 1982.
: “People,” Ohio Outdoor Sculpture Inventory, accessed April 18, 2019, http://oosi.sculpturecenter.org/items/show/924. Located near the Perry Street entrance of the building; attached directly to the building wall.